Grief expert and registered nurse Gail Trauco's new book series helps children and their families better understand grief and loss, especially in the areas of divorce and death of a parent or close family members. it is very natural for any person and especially children to want to “run and hide” in the face of grief and loss, says grief expert and new children's author Gail Trauco, R.N. Numerous authors have written on the subject of divorce although few have successfully approached it from a child’s point of view, in a way for children to understand and recover from the losses they experience from their parent’s divorces. 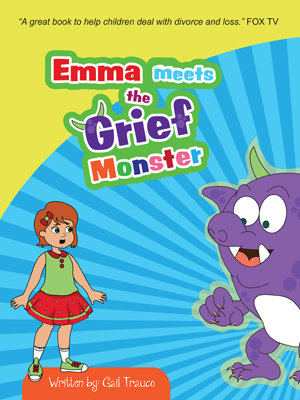 Emma meets the Grief Monster is a new children’s book series written by long time grief expert and registered nurse Gail Trauco. The sweet, simple and down home approach she brings to this series is inspired by her Southern upbringing and informed by Trauco’s own healing after numerous losses and major life changes during her childhood, including grief of poverty, abandonment, medical uncertainty, and death of relatives and pets. Emma meets the Grief Monster brings young readers into the life of an 11 year old girl, who loves her family and playing basketball with her team of neighborhood girls. Out of the blue, Emma learns that her father is leaving home and divorcing her mother. In this first in a series of eight books, Emma is caught completely off guard by the news and the last thing she wants to do is believe it is real. Then, as if on cue, the Grief Monster (an endearing Purple character with horns and big pointy teeth) appears in her bedroom to announce his arrival and pledge his support for Emma in the coming days and months. According to Trauco, it is very natural for any person and especially children to want to “run and hide” in the face of grief and loss. The Emma meets the Grief Monster book series is consciously designed to help introduce the seven stages of grief and the feelings that go with them in terms that make sense to a child. The character of Emma, created by Trauco and brought to life by illustrator Ms. Mahfuja Selim, is a young courageous archetype that boys and girls of all ages can relate to and learn from. The remaining seven Emma meets the Grief Monster books will be published one after the other between now and Spring 2017. Each of the books will be available via Amazon.com and in select bookstores and hospital gift shops around the country. 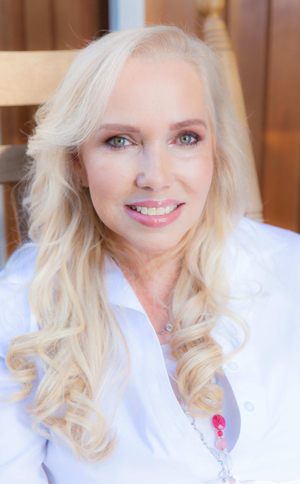 For more information about Emma meets the Grief Monster (the first book) and/or author Gail Trauco visit: http://www.EmmameetstheGriefMonster.com and http://www.FrontPorchTherapy.com. Emma meets the Grief Monster (the first in a series of 8 books) is 38 pages. Gail Trauco endured more loss and sadness in the first 12 years of her life than most people do in a lifetime, yet you will not hear her complain about the past. Instead, Trauco considers it all part of the path she is on as an advocate for people going through challenging times. During the past 30 years, Trauco has helped more than 5,000 families navigate the grieving process following a variety of losses, including deaths and divorces. She is a mother of three grown sons and now calls her ranch with a multitude of animals and a lovely front porch in Forsyth, Georgia her home.